When I first got a copy of Hockey Night in Canada: My Greatest Day , I said to myself "This book sure looks familiar." That would be because Hockey Night in Canada and author Scott Morrison teamed up last year with the hit By The Numbers, looking at the best players to wear every jersey number in history. This year they are back with My Greatest Day , looking at 50 people's greatest hockey moments, not necessarily games, in their lives. Aside from the content, everything about the two books are nearly cookie-cutter identical - the cover image, the flashy layout, the interior graphics and fonts, the colorful sidebars, the fancy paper, the beautiful photography. I guess that means this Hockey Night in Canada entrance into the book market last season is intended to be an annual occurrence. That's a great thing, as the production level is as high as it comes and the content has so far been tremendous. 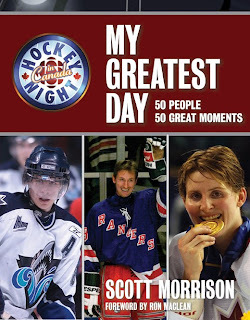 In Hockey Night in Canada: My Greatest Day Morrison interviews 50 hockey people. Some are current NHL players while others are retired. Some are female Olympic players. Some are coaches and others are managers. And in a real interesting interview decorated Canadian military general Rick Hillier is included. Morrison asks each to describe their greatest day of hockey in their life. As publisher Key Porter suggests if you ask ten hockey players you'll get ten different answers. If you ask fifty you have a book. Stanley Cup victories and first NHL games and goals are common, but there a lot of surprises, too. Gordie Howe talks about the first time his mom and dad saw him play in Detroit. Darryl Sittler forever cherishes the night the Leafs retired his number. Referee Paul Stewart remembers his playing days when he got into three fights in his first NHL game. Paul Henderson's greatest day is obvious. Mark Messier's was not, and he never actually does pick on moment. Very interestingly Cassie Campbell picks a university championship over all those Olympic and World Championship gold medal victories as her greatest moment. And Tony Granto's greatest moment was when his sister, Cammi Granato, helped the US women's team capture Olympic gold in 1998. And General Hillier talks about the day the Stanley Cup visited Canadian troops serving in Afghanistan. What about Scotty Bowman? Bobby Clarke? Sidney Crosby? Wayne Gretzky? Gordie Howe? Well you'll have to buy the book to find those out! Each person's account is engaging and honest. Morrison does a good job of re-telling each person's stories with a nice, personal tone.